From 1883 until 1887 Wilhelm Kuhnert studied under Bellermann and Meyerheim at the Royal Academy of Fine Arts Berlin. His period of residence in Berlin was interrupted by a number of journeys. 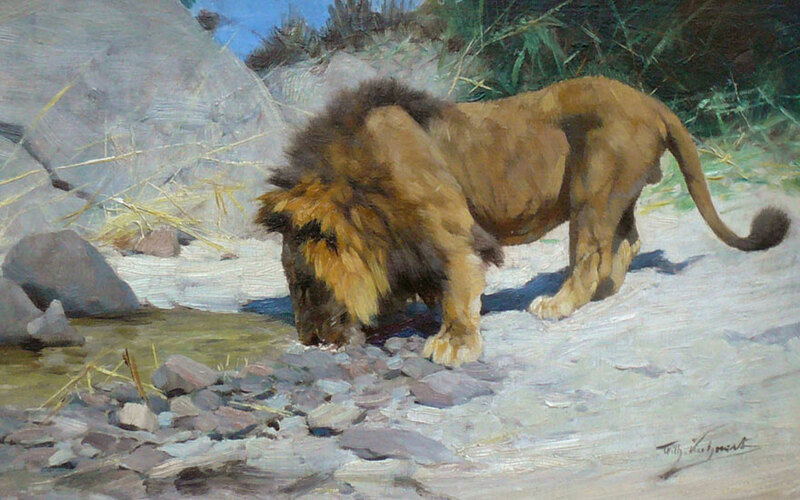 For his landscape and animal studies he travelled to Egypt, South Africa and India. In his oil paintings Kuhnert depicted animals in their habits and struggle for survival. “Das Tierleben der Erde” (Animal Life on Earth), a three-volume book by Johann Wilhelm Haacke which Kuhnert illustrated, marks the end of his comprehensive work as a drawer. Kuhnert caught the mood and nature of tropic landscapes in light but cool colors.